SnapSports® Partners with AAU as the Official Courts for the 3rd Annual AAU / Jam On It Memorial Day Basketball and Volleyball Tournament in Las Vegas. SnapSports surfacing, with multi-patented technologies, is the only modular sports flooring that meets AAU's high standard. SnapSports® teams up with AAU ‘Jam On It’ this Memorial Day Weekend as they, again, join AAU for the 3nd Annual Las Vegas Memorial Day Tournament, being held at the Tarkanian Basketball Academy, May 28th-30th. The 2016 ‘Jam On It” Las Vegas Memorial Day Tournament will feature over 120 teams competing on 10 SnapSports® ShockTower® Championship Courts. The multi-patented ShockTower® technology is the only surface available to incorporate a shock absorption system into the understructure of the floor. 16 individual shocks per square foot ease the impact on player’s joints, guaranteeing a safer sport surface for any sport including basketball and volleyball. The ‘Jam On It’ Vegas Tournament is unique as it will host both basketball and volleyball competitors, boys and girls ages elementary through varsity. To accommodate the complexity of a dual sport event, athletes will play on SnapSports® BounceBack® and Revolution® Shocktower® surfacing, chosen for its superior high performance and player safety. The versatility and high performance of SnapSports’ products has made them the preferred choice of athletes, coaches, and event facilitators. 'Jam On It' is recognized as one of the world’s premier event organizers with 24 years of experience. 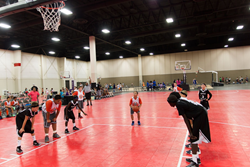 As a proud member of the AAU, Jam On It has been selected to host local, regional, and national AAU events. Jam On It also manages two multi-court facilities in Northern California housing 20 courts between the two facilities. SnapSports manufactures 24/7 in their 180,000 square foot ISO 9001:2008 Quality certified facility in Salt Lake City, Utah. SnapSports is the Official Court of AAU Basketball Jam On it, AAU All Under one Roof, The Big South, The United States Futsal Federation, 2016 NBA Centre Court , NBA Nation, 2015 NBA House, NBA 3X, and USA Team Handball. SnapSports is an official FIBA Technical Partner and has been a proud partner of The Special Olympics, The National Veterans Wheelchair Games, The Volleyball Festival, Gus Macker 3X3, The Vanilla Ice Project, World Police & Fire Games and The National Collegiate Roller Hockey Championship to name a few. SnapSports surfaces are made in the USA and played on around the world.